Paliem Beach makes a great way to explore the whole area and is a charming beach in the region. Plan your trip and include this destination to witness natural beauty and serenity. Paliem Beach is an experience that you should not miss out on as the place has a lot to offer. Listen to the safety instructions given by the authorities. You can take a taxi or a hired vehicle near the place and walk up to the destination. Love this? Explore the entire list of places to visit in Arambol before you plan your trip. Fancy a good night's sleep after a tiring day? Check out where to stay in Arambol and book an accommodation of your choice. How popular is Paliem Beach? People normally club together Paliem Lake and Mandrem Beach Resort while planning their visit to Paliem Beach. walk from the Harmal beach to reach Kalacha. Get wet in the beach and have a refreshing bath in the sweet lake. One of the best places in goa. Sunset views here are the best thing to watch. This is my favourite beach, and there is a Sweet Lake. 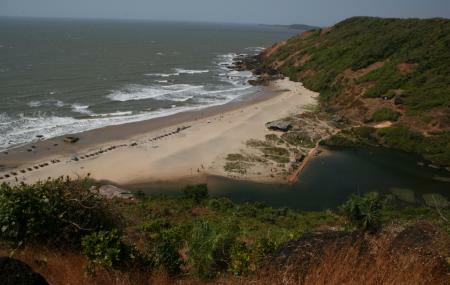 You will find sweet and salty water on the same beach..... A must visit beach in Goa. I am in L.O.V.E with this beach. It's so amazingly beautiful. The sweet lake view is even better than the seashore view. If you are visiting this beach take out one full day and go there as you won't feel like going back to your places. This is the best beach in the north so far that I have seen! Am visiting there again very soon!